Dedicated for clarinettists from all levels. Is a good way of getting to know a great professor of Germany and start a good learning process in Valencia. The Masterclass will have 3 private lessons for each participant of 1 hour approx. each lesson. Two lessons with Prof. Johannes Peitz and one with Jordi Juan Perez. 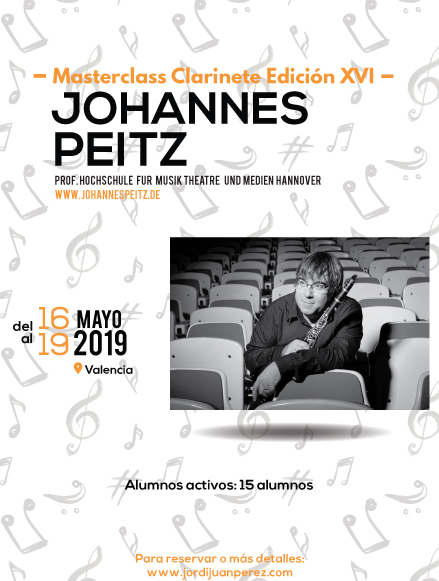 Many of the participants of the Masterclasses have studied with Prof. Johannes Peitz in the University of Hannover, Germany. The lessons can be done in German, English, Spanish or Valencian. Enter your information if you want to register below. Jordi is one of the most creative and spirited musicians i have worked with as a teacher. Always in the depth of musical expression and just as focussed and present at the same time. Experiencing Jordi is always something special.